Deep Freeze Cold Patch is cooling therapy for the relief of pain from sprains, strains and knocks to muscles and joints. Deep Freeze Cold Patch is a cooling therapy for muscle and joint injuries that is well established and recommended by sports physiotherapists. Prompt cooling has been shown to effectively reduce pain and may help in the healing of minor injuries. Cooling therapy can also be used to soothe tense, tired or sore muscles and joints. 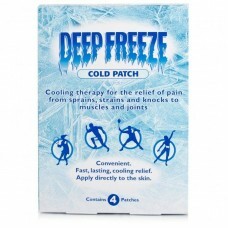 Deep Freeze Patch is convenient and easy to use, is placed directly onto the skin and can be used under clothing. It is a fast acting, adhesive, cooling patch that provides lasting, soothing relief from the pain of sprains, strains and knocks. 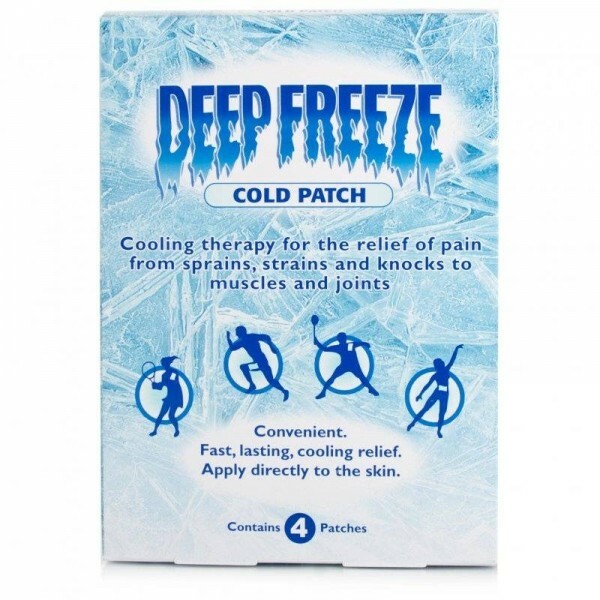 How to use Deep Freeze Cold Patches: Apply the patch to the affected area as soon as possible after injury. The cooling effect of the patch will be felt quickly and can last up to 3 hours. A new patch may be applied as required. Do not use more than 4 patches one after the other on the same area. Cooling therapy should continue until pain or swelling has reduced.